The F-Factor diet is not so much a diet as it is a nutrition lifestyle that puts the spotlight on the importance of fiber in healthy eating. You choose more nutrient-dense, high-fiber, complex carbohydrates instead of low-fiber ones to improve the fiber content and quality of your diet. Combined with lean proteins and healthy fats, you can lose weight if you want to. Download a printable shopping list to help you select foods allowed on the F-Factor diet. 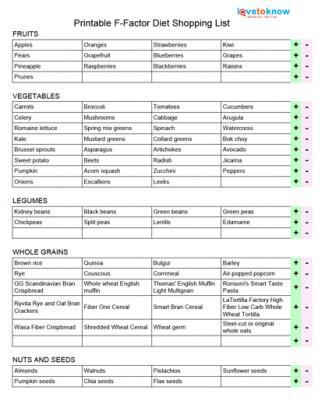 This printable shopping list for the F-Factor diet contains a long list of foods to choose from. Click on the image to download and print the list and take it with you when you go grocery shopping. Refer to this helpful guide if you need assistance downloading the PDF printable. Click to download the shopping list. Foods on the list are organized by food groups. 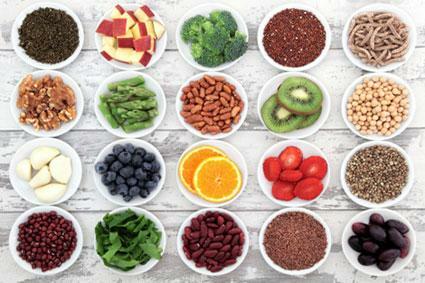 There is space at the end of each food group to add any other high fiber favorites you desire to the list. You are allowed to choose your favorite high fiber carbs from each of the fruits, vegetables, whole or fortified grains, legumes, and nuts and seeds food groups. You also have choices of healthy lean protein, dairy, and fats. The "OTHER" group is a short list of fiber snack bars and a fiber desert. Excellent sources of fiber have five grams or more fiber per serving, and good sources have at least four grams. Ensure you read the ingredients on the product labels of packaged foods fortified with added fiber to learn the source of that fiber. Synthetic fibers added to increase the fiber content of food are not the same as the natural fiber you get from the abundance of plant foods. When buying packaged foods, look for items that have fewer than ten grams of sugar per serving. Tanya Zuckerbrot, M.S., R.D., a registered New York dietician and author, created the F-factor diet to help people improve their nutrition and health and decrease their risk for diet-related health conditions. The diet is not a new idea, however. Instead it highlights existing, official recommendations to eat more high-quality complex, low-starch, high-fiber carbs in place of low-fiber, high starch or refined carbs. This will naturally reduce calorie intake because of the fewer calories in non-starchy, high-fiber carbs. Eat high-fiber carbs and lean protein at every meal. Eat eight GG Scandinavian Bran Crispbread daily - each has eight grams of fiber - to help you feel full all day. Take a multivitamin each day, which also contains essential minerals. Drink three liters of water a day. You can drink wine but no beer or sugared drinks. Keep a food journal, which helps you stay on top of what you are eating. A four week diet plan, food choices, menus and recipes, and the underlying science are described in detail in Ms. Zuckerbrot's book, The F-Factor Diet: Discover the Secret to Permanent Weight Loss. On the diet you eat about 900 to 1,400 calories a day, containing 40 to 50 grams of fiber and 50 to 70 grams of carbs. As with any new plan of eating, planning, preparation, and convenience are some of the keys to success. Having a handy reference shopping list with you will simplify your grocery shopping expedition.